A couple of weeks ago, I wrote about the prices I was hoping that Iconic Masters cards were going to drop to, and we have reached a point on some of these that I’m comfortable moving in. I don’t think I’ll need to tell you much about these cards, but this is a calendar point where I’m ready to pick up some copies. Unstable drops today, and with this being the Christmas-New Year’s lull for tournaments, sales, and other Magic activities, I don’t think much more Iconic Masters will be opened. 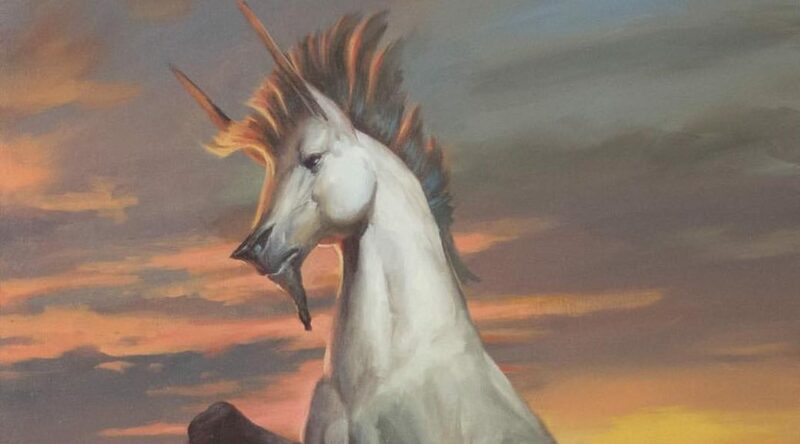 Rivals of Ixalan has already had a couple of spoilers/previews land, and that will start in full force after New Year’s Day, so there likely won’t be a ton of product opened. Even if prices fell another 5-10%, I’m content to get in on some of these now, and perhaps even more if the price does indeed slip another step or two. On the flip side, there’s some cards from Iconic Masters that have fallen in price, but aren’t done falling. Be wary of these. Let’s get to the cards! Horizon Canopy ($33): It’s not done. $20? I can only find fringe versions of decks running more than two, though there’s a Five-Color Humans build in Modern that’s playing four of the 19 lands as this cantrip. The Future Sight version has lost nearly half its value, and I don’t think that’s done falling either. Ebay’s completed sales show just a few over $30 in the past two weeks, and a whole lot more in the $25 range. Not all that many people need this land, so I’m staying away. 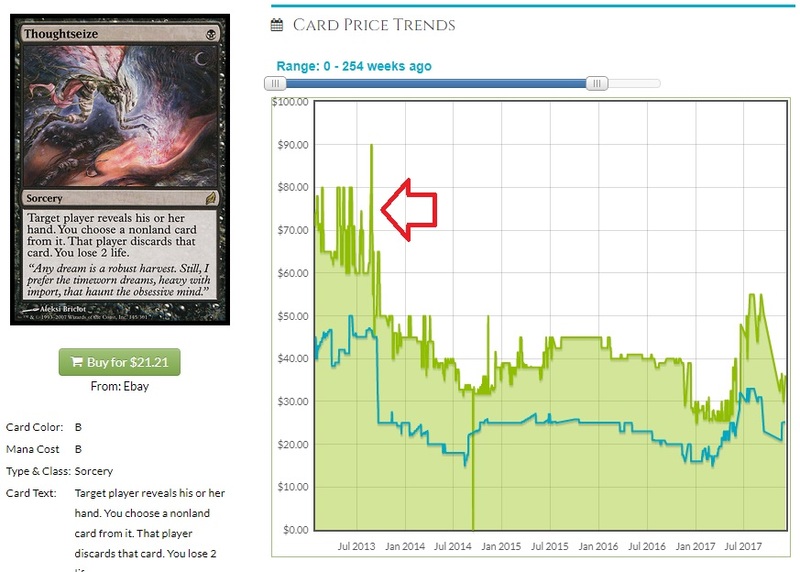 The red arrow is the release of Theros, 2013! Those halcyon days. Every time it’s had a printing, the value has taken a hit and then climbed back up. 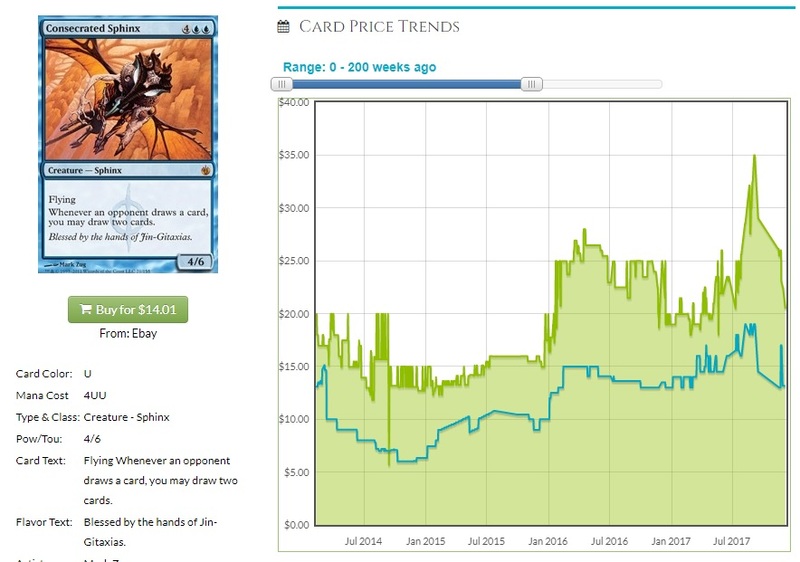 I didn’t get in on this when Theros came around, and I don’t think there is any doubt that it’ll climb back up again. It’s not going to hit $80 again. It’s not going to crack $50 for some time. I’m staying patient until I can get them for $10 each on eBay, and that time hasn’t come yet. If you want to pull the trigger on a playset or two in the $12 range, I can’t fault you. When it looks like it’s flattened off, or when Rivals of Ixalan comes out, I’ll be ready to dive in. Cryptic Command ($20): I’m staying patient till $15.We’ve got several version of Very Cryptic Command to fool around with and distract casual players, and while a playset of Cryptic is a starting point in Modern control decks, control isn’t too popular an archetype. I’m watching these on eBay closely too, and I have managed to get a couple at my target of $15. I’d much prefer that some retailer sell me a few in a batch, though. Grove of the Burnwillows ($13): Get out. Now. If you open one of these I would buylist it immediately and not look back. Sure, it’s a Punishing Fire combo in one Legacy deck, and maybe you have a deck that abuses the lifegain somehow, but these are few and far between. The demand is not there, and I think this has a lot farther to fall before I’d want copies. Consecrated Sphinx ($12): This is a super interesting card, and therefore a place I’m hesitant to put in much money. Sure, it’s one of the best things a blue deck can do in Commander or Cube, but those are the only formats where it sees play. The original mythic had made it up to $30, even with the Invocation draining demand somewhat, but now the slide is on. I am watching eBay for $10 copies, and foils under $20. This had started to recover nicely from the Invocation in early 2017. Even as I watch the card get cheaper, I’m hesitant. This is an excellent candidate for a ban in Commander, and it’s in 14,000 decks! It would be a bloodbath.That risk is going to keep me from going too deep, and your taste for risk should determine the number of copies you want to get. Archangel of Thune ($11): I don’t think this will fall too much farther. It’s been a mythic twice, never a rare, and that’s big for the number of copies out there. I strongly suspect casual players are soaking up copies as well, because it’s good in Commander but not overpowered. If it’s unanswered, sure, the game’s over, but that’s the case in that format. What I really like about Archangel is that looking into lifelink cards clued me into foil Crested Sunmare at $8. There’s only 40 copies on TCG, and it’s a top card for lifelink decks. There’s not much demand for Oloro, Ageless Ascetic, as there’s competition for who your lifelink Commander should be, but Sunmare is way up there on the list of things to do if you’ve got a lot of gain life effects around. Only 40 copies for a recent foil mythic, that’s a top target for me going forward. Cliff is an eager participant in unusual formats, and is hoping to cube four times a day at the next GP. Find him on Twitter @wordofcommander or here on MTGPrice every Friday.